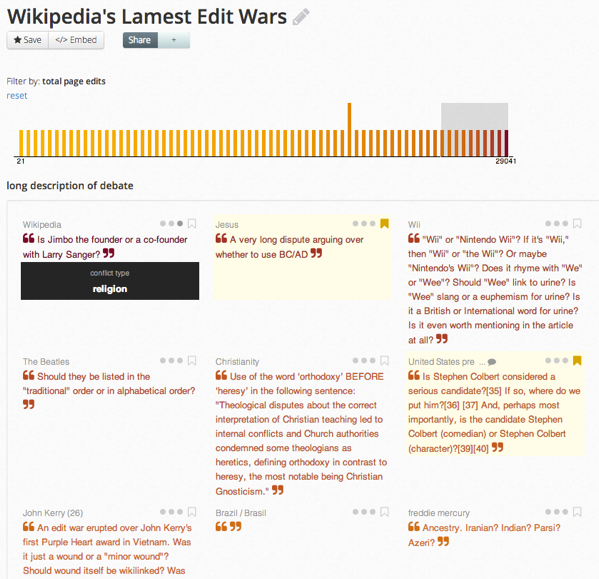 Below is an example with information about Wikipedia's Lamest Edit Wars. For another example, browse data about the most popular Reddit IAmAs for 2012. Like our other free visualization tools in Juice Labs, the Comments visualization is designed for ease of use and sharing. Just drop in your own data, choose what fields you want to show as text and as values, and the visualization will immediately reflect your choices. The save button gives you a link that includes your data and settings. If you enjoy this tool, definitely try out our Leaderboard or searchable, sortable Table. Or if you want to incorporate a series of these visualizations together in an interactive report or dashboard, contact us about Slice. Older PostNFL Rushing Tendencies Visualization...or Ahhhh, It's a Spider!